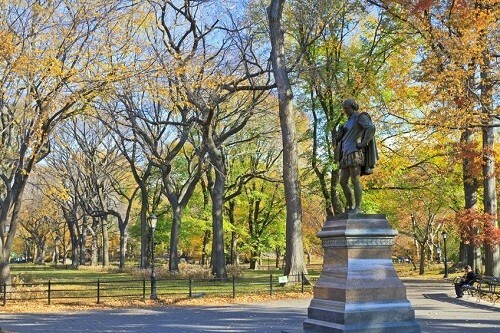 Most New Yorkers and many tourists are aware of Shakespeare in the Park, held annually at the Delacorte, an outdoor amphitheater in Central Park that is run by the legendary Public Theater. Ever since 1957, the theater has offered free performances of Shakespeare and other noted playwrights to people willing to brave hours of waiting in the formidable line. Although a great many people know of Shakespeare in the Park, most don’t seem to know exactly how one goes about lining up and getting tickets. The following is an in-depth guide to teach you how to maximize both your Delacorte experience and your chances of actually getting into the show. The Delacorte seats 1,800 people, and so there are, indeed, a lot of tickets to give out every day. Each person, however, is allowed to request two tickets, which could theoretically double the length of the line. In addition, the Public sets a certain number of seats aside for subscribers, the media, contest winners (more on that later), and the like at each performance. The tickets are handed out at 1 PM for the 8 PM curtain. Do not arrive at 12:30, assuming that that you will get tickets. The best time to arrive is between 6 AM and 7 AM. If you want to ensure that you’ll get seats, you’ll also want to make it to the show as early in its run as possible. Check the schedule online at ShakespeareinthePark.org. The closer to the last performance it gets, the more people crowd the lines, trying to grab their one last chance to see it. Although it is always important to arrive as early as you can, don’t be scared away if the line looks extremely long. The line always looks longer than it actually is because people spread out on blankets and towels. Don’t worry. If you are actually so far back in line that you aren’t likely to get in, the Public’s line monitors will let you know. Once you line up for Shakespeare in the Park, you are not allowed to leave the line for any reason other than to use the bathroom. You are also not allowed to cut in line by joining up with a group of friends who are already there. The Public instituted this rule to make the situation more fair to people who actually devote the day to waiting for their tickets. Therefore, you will want to bring activities with you—books, board games, laptops, iPods, work, or whatever will keep yourself occupied for the hours and hours you will be waiting. It’s always fun to go with friends. Even on a hot summer day, there is usually a great deal of shade and a breeze, thanks to the park’s copious foliage. The line provides a perfect excuse to hang out with your friends outside, enjoying one of the greenest and most beautiful areas in New York’s urban landscape. Sometimes, lining up for Shakespeare in the Park will prove to be even more entertaining and rewarding than the play itself. Also, don’t worry about having to bring a packed lunch. There are numerous nearby restaurants that deliver food to the line. The line monitors will be happy to provide you with their phone numbers. Some people avoid the line on a gray day because they are worried that the night’s performance will be canceled. In actuality, a cancelation is extremely rare. The Delacorte will delay the play up to half an hour if it’s raining before the play begins. If it begins to rain during the show, the theater will pause the performance and attempt to resume once it stops. If it’s only drizzling, the show often won’t halt at all. Many people don’t want to risk either sitting outside in the rain or waiting for hours for a show that might be canceled, but the flip side to this is that less people line up, which increases your chances of getting a seat. Use your judgment. If the forecast predicts a 90-100% chance of torrential downpour all day, you probably shouldn’t bother getting in line. However, if there’s a 30-50% chance of light rain, it could be the perfect opportunity to see some free Shakespeare. Bring a raincoat, and you’ll be fine. This piece of advice should be common sense. Because more people are off of work on the weekend, this is when the lines get most packed. If people are going to take some time off of work, it will most likely be on a Friday or a Monday, in order to extend their weekend, so your safest bet for getting in will be a Tuesday, Wednesday, or Thursday. Always check the schedule online to make sure that a show is scheduled for that evening, of course. In case you are worried about lining up and not getting in (which is always a minor possibility, even if you take every precaution), you also have the back-up option of entering your name into the daily lottery on Shakespeare in the Park’s website. The contest only has a limited number of seats, so if you are desperate to see the show, this is the least reliable means of getting your ticket. However, if you are already planning on lining up, regardless, entering online gives you a second chance. If you do happen to win the lottery and get your tickets in line the same day, you can return your extraneous ticket to the box office before the show starts when you arrive for the performance in the evening. Shakespeare in the Park often has a long standby line of people who would be thrilled to get your returned seat. To review, in order to ensure you get your tickets for Shakespeare in the Park, arrive early in the day and early in the run—ideally in the middle of the week—bring entertainment, take a gamble on a wet day, and enter the online lottery. Shakespeare in the Park is a quintessential New York summer activity, one that, with a bit of careful planning, you can soon be enjoying with your friends and loved ones.